A canalplasty is performed to widen a narrowed (either congenitally or acquired) external auditory canal (EAC). The procedure is performed for a number of reasons. The most common reason for canalplasty is to enhance access for mastoid surgery or during a lateral graft tympanoplasty. Other primary reasons include removal of bony or soft tissue growths or scar tissue, or as part of surgery for aural atresia, which is addressed elsewhere. The motivation for surgery in these later cases may be chronic infection, trapped debris, or hearing loss due to an occluded EAC. The benefits of the procedure are improved drainage of the ear and potentially improved hearing as well. The external auditory canal (EAC) develops out of the first branchial groove or cleft. The groove deepens at 8 weeks to form the primary EAC that will develop into the adult cartilaginous EAC. A tubular structure called the meatal plate then forms at the medial aspect of this groove. This is a core of epithelial cells that typically canalizes around 21 weeks of development. The cells from the cord contribute to the bony EAC and the epithelial lining of the canal, including the lateral epithelium of the tympanic membrane. Anomalies in this development can lead to canal aplasia, atresia, stenosis, or duplication. In adulthood, the EAC is approximately 2.5 cm in length and composed of a lateral cartilaginous portion and a medial bony portion (see the image below). The medial bony structure of the external auditory canal primarily consists of the tympanic bone, a ringed lateral projection of the temporal bone. A superior notch in the tympanic bone is called the notch of Rivinus, which is located at the junction of tympanosquamous and tympanomastoid suture lines. Cross-section of the middle and inner ear. The arterial supply includes the posterior auricular artery, deep auricular branch of the maxillary artery, and superficial temporal artery. The most common indication for surgery for acquired EAC occlusion is otitis externa refractory to medical management. Surgery can improve the success of topical treatment and improve access to prevent debris accumulation. Patient presenting symptoms include recurrent otitis externa, sensation of plugging, hearing loss, pain, and tinnitus. Surgical indications include conductive hearing loss from impedance of air-conducted sound, chronic infection, or debris accumulation behind an obstruction. Additionally, canalplasty may be performed due to poor intraoperative visualization of the anterior sulcus of the external auditory canal when performing a tympanoplasty procedure. Most surgeons prefer the patient not to be acutely infected with otitis externa at the time of operation and may therefore recommend ear canal debridement and topical medications prior to proceeding with surgery. Facial nerve monitoring may be performed in some cases to assess proximity to the facial nerve. If facial nerve monitoring is used, discussion with the anesthesiology team should include limiting any use of long-acting paralytic agents, as this will inhibit accurate monitoring. Knowledge of anatomic relationships, particularly the location of the temporomandibular joint (TMJ), is essential for injury prevention. Gulya AJ. Glasscock-Shambaugh Surgery of the Ear. Shelton, Connecticut: People's Meical Publishing House. 2010. Adad B, Rasgon BM, Ackerson L. Relationship of the facial nerve to the tympanic annulus: a direct anatomic examination. Laryngoscope. 1999 Aug. 109(8):1189-92. [Medline]. Cummings Otolaryngology. Head & Neck Surgery. Mosby-Elsevier: Philadelphia, PA; 2010. Lavy J, Fagan P. Canalplasty: review of 100 cases. J Laryngol Otol. 2001 Apr. 115(4):270-3. [Medline]. Jacobsen N, Mills R. Management of stenosis and acquired atresia of the external auditory meatus. J Laryngol Otol. 2006 Apr. 120(4):266-71. [Medline]. 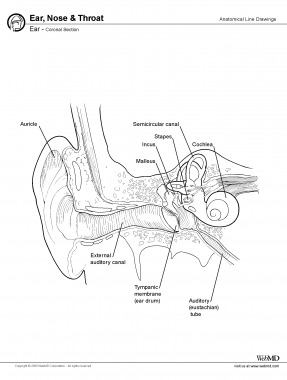 Droessaert V, Vanspauwen R, Offeciers E, Zarowski A, Dinther JV, Somers T. Surgical Treatment of Acquired Atresia of the External Auditory Ear Canal. Int Arch Otorhinolaryngol. 2017 Oct. 21 (4):343-346. [Medline]. [Full Text]. Grinblat G, Prasad SC, Piras G, He J, Taibah A, Russo A, et al. Outcomes of Drill Canalplasty in Exostoses and Osteoma: Analysis of 256 Cases and Literature Review. Otol Neurotol. 2016 Dec. 37 (10):1565-1572. [Medline]. Timofeev I, Notkina N, Smith IM. Exostoses of the external auditory canal: a long-term follow-up study of surgical treatment. Clin Otolaryngol Allied Sci. 2004 Dec. 29(6):588-94. [Medline]. House JW, Wilkinson EP. 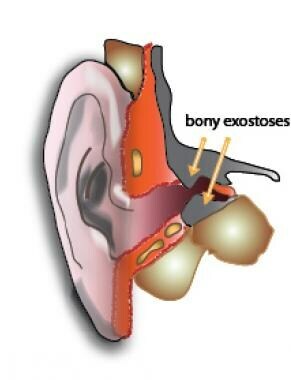 External auditory exostoses: evaluation and treatment. Otolaryngol Head Neck Surg. 2008 May. 138(5):672-8. [Medline]. Nogueira C, Mallick F, Kaushal S, Banerjee A. The swing-door island flap canalplasty technique. Ann Otol Rhinol Laryngol. 2014 Dec. 123(12):835-9. [Medline]. Li C, Zhang T, Fu Y, Qing F, Chi F. Congenital aural atresia and stenosis: surgery strategies and long-term results. Int J Audiol. 2014 Jul. 53(7):476-81. [Medline]. Ghavami Y, Bhatt J, Ziai K, Maducdoc MM, Djalilian HR. Transcanal Micro-Osteotome Only Technique for Excision of Exostoses. Otol Neurotol. 2016 Feb. 37 (2):185-9. [Medline]. Disclosure: Received travel reimbursement to attend a conference. for: Med-El.